Beautiful foliage, noxious fruit. (While taking these photos, a passing child asked, "Mommy what's that awful smell?" The two gingko trees down the street are dropping their fruit. I don’t have to see the evidence because I can smell it from a block away. We don’t call them stinko gingkos for nothing. The trees produce beautiful golden fall foliage, but heaven help those who have female versions of the species, which produce fruit that smells more rotten than a frathouse hallway after a two-day kegger. But culinary beauty is in the eyes of the beholder. 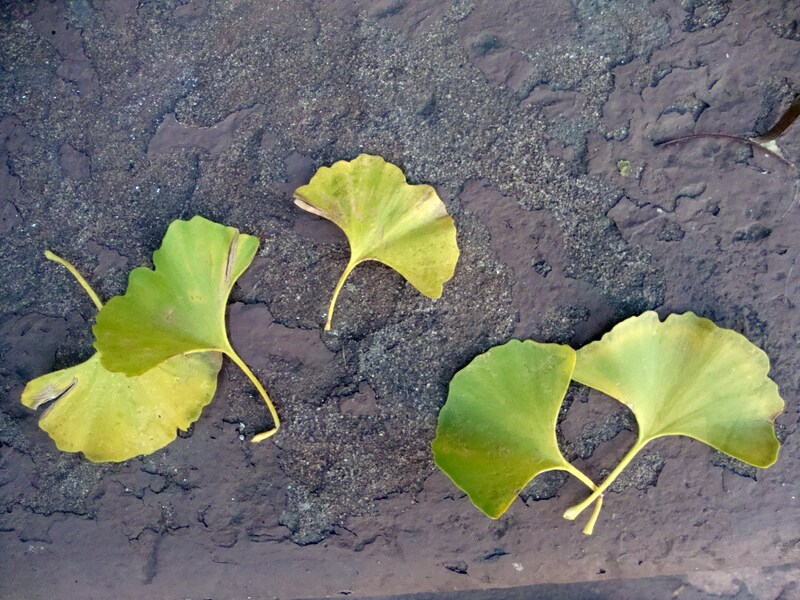 I once lived on a street that was, unfortunately, lined end-to-end with female ginkgos. Gingerly making my way down the block one fall day, trying not to breathe too deeply, I saw an elderly Chinese couple busily gathering the soft, lychee-like fruits that contain pistachio-sized nuts. Curious what they could possibly be doing with them, I stopped to ask. “The nuts make delicious soup,” the woman told me. Apparently, when shelled of their soft and noxious outer coating, and boiled or roasted, ginkgo nuts take on a chestnut-like flavor that’s used in savory or sweet dessert soups and other recipes. And while we’re on the subject of wild fall harvesting, here’s a Native American preparation for acorns, which have also been abundant this season, if the squirrels haven’t beaten you to them. It involves long soaking and nylon stockings. . .
Soak mushrooms in warm water for 30 minutes. Save soaking liquid and set aside. Dice mushrooms. Cut chicken in one-inch pieces. Mix cornstarch, white wine or sherry and one tablespoon oil in medium-sized bowl. Add chicken and toss to coat. Heat remaining oil in wok or large frying pan. Sauté scallion and ginger until fragrant. Add chicken and stir fry until cooked through. Add the ginkgo nuts, snow peas and mushrooms. Stir fry an additional minute or two.